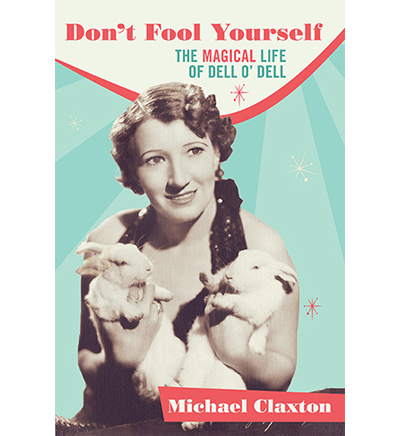 Don't Fool Yourself: The Magical Life of Dell O'Dell by Michael Claxton. In a field dominated by men, one of the most successful and busiest magicians of a generation was also a woman. Dell O'Dell grew up in Kansas, and learned to love show business amidst the sawdust and spangles of her father's circus. She learned to entertain as a teenager, teaching herself to juggle, perform acrobatics, and work with animals. Eventually, she would go on to own her own circus, perform as a comedy magician in vaudeville, and finally find certified stardom as a headlining night club performer and television star. Half a world away, in Switzerland, Charles Carrer was learning many of the same feats of digital dexterity. He developed a polished, dapper, and amazing juggling act that took him on tours throughout the European continent, South American, and eventually landed him in America. It was there, in New York, that the two troupers met, married, and embarked on a partnership - both on and off stage - that has to be read to be believed. In the pages of Don't Fool Yourself, author Michael Claxton draws on first-person accounts, revealing research, and rich historical archives to paint humanizing and captivating portraits of Dell O'Dell and Charlie Carrer, remarkable entertainers whose lives were intertwined - as well as fascinating bygone eras of American show business. A quality 6 x 9" hardcover, 332 pages, illustrated with dozens of unpublished images. As a bonus, each book includes a Dell O'Dell Dancing Doll novelty!